SSI SCHAEFER offers its WEASEL® automated guided transport system that can be equipped for manual, semi-automated, or fully automated operation as needed. Operation is straightforward: Employees can supply a manual transfer station in advance. The fleet controller handles the job of sending the WEASEL® to the corresponding station. 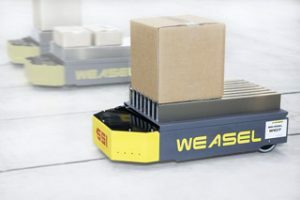 The WEASEL® then automatically picks up the load carriers. Using a transfer conveyor makes the transfer process even more efficient. The system does not require numerous sensors or a complex control system. Instead transporter fleet navigates along an optically designated lane. This lane can be applied quickly and easily and can also be modified at any time. The WEASEL® achieves speeds of up to 1 meter per second on paths with a gradient of up to 20%. The standardized control software can be installed quickly and easily. The transport orders are generated by manually activated radio commands (stand-alone solution), third-party systems such as production machines with a PLC, or an existing material flow system. A fleet controller manages the orders and assigns them to the corresponding vehicles. Power is supplied via maintenance-free battery packs that can be recharged manually in a charging cabinet automatically via floor contacts. Each unit can achieve operating times of up to 16 hours with one battery charge. This automated guided transport system is ideal for handling containers, cartons, and even hanging goods.